Guitarist Evan Drummond has been a featured performer throughout the United States, Canada, and Europe. Drummond joined the Music Department faculty as lecturer where he teaches private guitar instruction, guitar chamber music, music history for non-majors, music theory for non-majors, and aural perceptions. Drummond also holds a position at the State University of New York, Fredonia School of Music as instructor of guitar. His previous appointments include teaching at Eastman Community Music School, the California State Summer School for the Arts, and the New York City Guitar School. Evan Drummond is currently a doctoral candidate at the Eastman School of Music where he was awarded a te aching assistantship. His educational credits also include graduation from Interlochen Arts Academy, bachelor of music from Eastman School of Music, and a master’s degree in Music from Yale University. 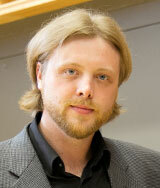 Recently, Evan Drummond also earned his Professional Studies Certificate at the Manhattan School of Music. Drummond has participated in master classes with Roland Dyens, Elliot Fisk, Sharon Isbin, David Russell, Manuel Barrueco, Raphaella Smits, Castellani Andriaccio Duo, and Pepe Romero. In addition to his emergent status as a performer and mentor, he has also experienced some early success as an arranger. The guitarist signed with Dunvagen Music Publications for an arrangement of a Phillip Glass composition. Drummond has also been a guest feature writer for Guitar Review Magazine.